Winnie & Walter Rerun Feature! New month, new rerun feature at Winnie & Walter Blog. 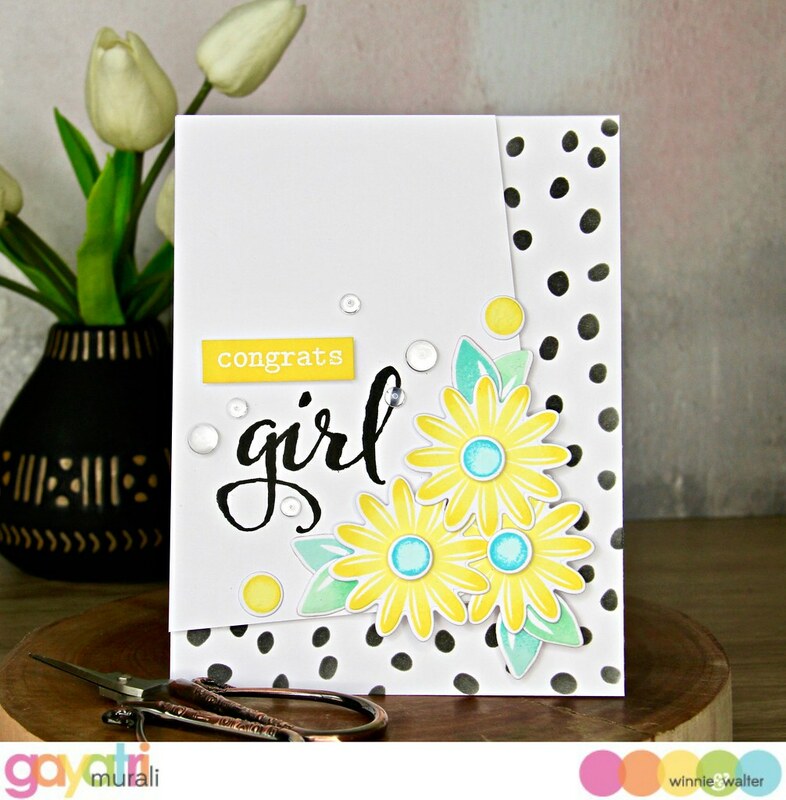 This month we are featuring The Big, the Bold and Baby stamp set. This feature runs for a month featuring a stamp set or cutaway. This set will be on sale this month and there is also a challenge with this rerun feature. Details on which I will share towards the end of the post. On Winnie & Walter Blog you can find more design team inspirations on this stamp set. Here is mine. On a white card base, I sponged black ink using Spotty Creative Screening. I then trimmed a white cardstocks panel at an angle on the card front. I adhered the panel on the card front using foam adhesives. I used In Bloom: Shirley’s Bloom stamp set to stamp the floral and leaf images and die cut using the cordoning cutaway. The inks I used here are from Altenew. I arranged the flowers, leaves and flower centres into a cluster and adhered on the corner of the angled panel as shown in the picture using foam adhesives. 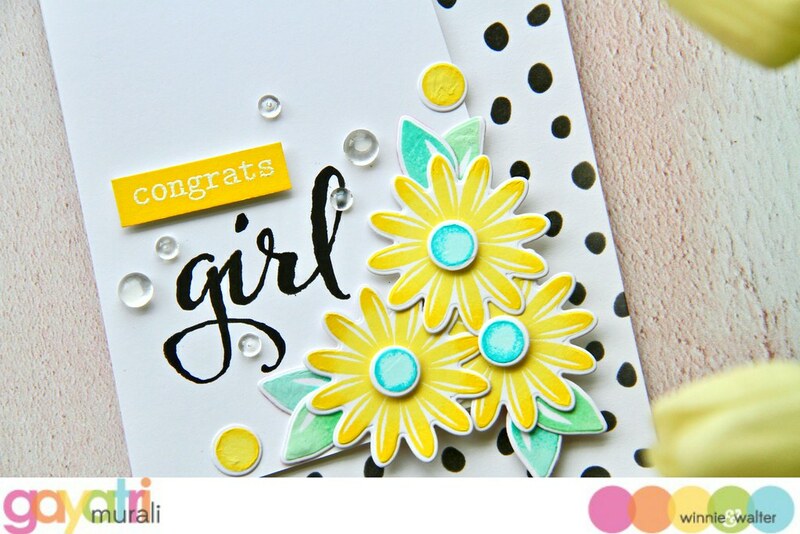 I put the card into MISTI and stamped the large sentiment from The Big, the Bold and Baby stamp set using Versafine Onyx black ink. This ties together the black spots on the background. 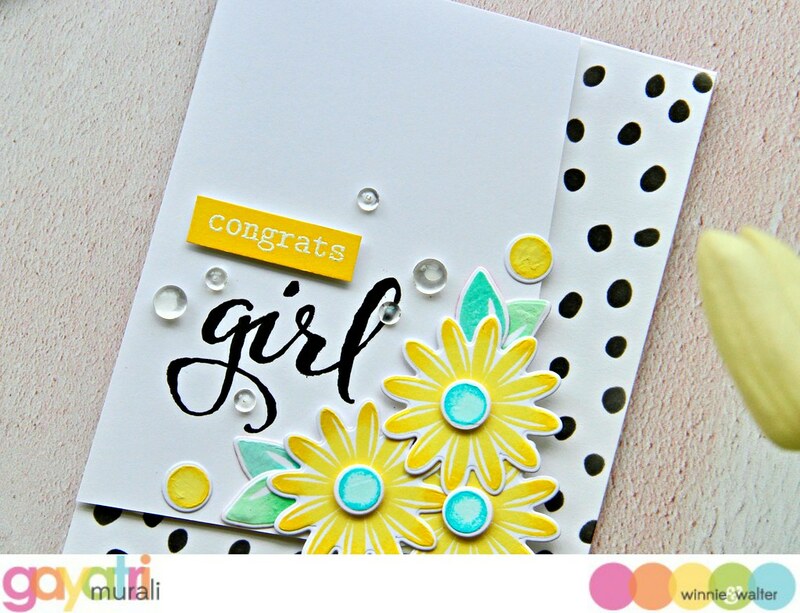 The smaller sentiment is white heat embossed on strip of white cardstock and sponged with the same yellow ink used to stamp the flowers. Then trimmed and adhered using foam adhesive. Finally some clear droplets completes the card. The Big, the Bold and Baby stamp set is sentiment stamp set full of baby related sentiments. But there are enough sentiment that can be combined to use for a non baby card like I have done here. I love the fresh colour combination on this card. All the supplies used to make this card are listed below. Create a new project using The Big, the Bold and Baby (and/or the digital elements). An alternative to using The Big, the Bold and Baby and/or the digital elements) is to create a new project using one of the projects featured in this post (or any Rerun post throughout March by The Talent) as your inspiration. Make sure you use at least one (1) w&w product (this can include a freebie found in the w&w shop) in your project. If you choose the alternative to using The Big, the Bold and Baby (and/or the digital elements), please include in your post or project description which project inspired you and how. Link up your project here by 11:55 p.m. CST on April 30, 2018. One project will be randomly chosen to win $25.00 credit to the w&w shop! The winner will be announced on the w&w blog later in May.